Since its initial entry into the Diagnostic and Statistical Manual of Mental Disorders—the psychiatric profession’s bible for classification and billing—post-traumatic stress disorder (PTSD) has rapidly emerged as a widespread and largely unchallenged phenomena that has permeated both mental health treatment and the broader culture. But what exactly is PTSD? Is it a discrete biological phenomenon? Or a socially constructed pandemic? And how has it become “the emblematic mental illness of the early twenty-first century”? 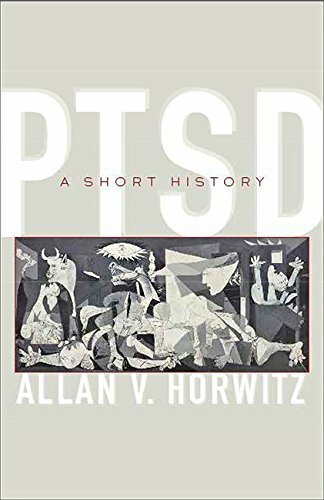 In his sharp, objective and highly skeptical biography of the illness, PTSD: A Short History, Rutgers sociologist Allan V. Horwitz both places the current state of traumatic illness in a valuable historical context and challenges readers to rethink their fundamental understanding of the condition presently known as post-traumatic stress. While psychological sequelae to trauma undoubtedly occurred throughout human history, Horwitz begins his biography during the 19th century, when soldiers responded to the brutal conditions of the American Civil War with a cluster of symptoms known as “soldier’s heart.” Many years after the carnage of Gettysburg and Shiloh, veterans wrote of “how the intense strain of battle persisted over time, causing intrusive recollections, startle reactions, and nightmares.” Horwitz notes that the Civil War was the earliest major military conflict “in which a high proportion of soldiers were literate,” allowing for “the first stirrings of psychological interpretations of wartime experiences.” Soldiers too traumatized to continue fighting were often branded as unmanly or cowards. While lobbying by veterans organizations resulted in President Benjamin Harrison signing a pensions bill for disabled veterans in 1890, the staggering cost of such payouts—they accounted for 40% federal government’s entire budget by 1893—shaped “subsequent discussions of traumatic neuroses” by reminding the public of “the tremendous potential burden” that such compensation might impose. In the period following the war, the expansion of American industry saw victims of train accidents pursuing tort claims against railroad companies and their insurers, claiming that they suffered from “railway spine.” Professionals actively debated whether these individuals deserved to be compensated. In contrast, British surgeon John Erichsen argued in his highly influential On Railway and Other Injuries of the Nervous System (1866) that “railway spine” was a genuine organic illness, producing “emotional symptoms” as a result of traumatic spinal compression. Yet over time, a third school of thought—what could be labeled as psychiatric, as opposed to legal or neurologic—gained influence. To physicians Jean-Martin Charcot, Pierre Janet, and, most notably, Sigmund Freud, traumatic reactions were conditions of the mind. Freud, of course, focused on childhood sexual trauma. He initially believed such instances pervasive, but later reinterpreted them as fantasies through which patients suppressed and reinterpreted their own shameful childhood experiences. One of the crucial questions that these physicians confronted was whether individuals who manifested post-traumatic symptoms were constitutionally predisposed to such illness. The vast number of soldiers who suffered “shell shock” during World War I and “combat neurosis” during World War I called into question the dominant medical belief that only those with preexisting character pathology were likely to suffer these conditions long-term. In other words, healthy individuals were expected to recover quickly. For those soldiers who did not, combat was merely the trigger for prolonged illness rather than the cause. This approach did not change significantly until the 1970s, when Vietnam veterans successfully persuaded Nancy Andreasen and the Reactive Disorders Task Force of the DSM-III to define the trauma in PTSD as the “existence of a recognizable stressor that would evoke significant symptoms of distress in almost everyone.” The pendulum had shifted from internal predisposition entirely to external factors. As Horwitz provides this detailed and fascinating intellectual history, he increasingly emphasizes the constructed nature of the phenomenon he is describing. Since neither medication or psychotherapy has proven as effective as hoped for PTSD patients, “survivors” have turned to non-allopathic remedies including “fishing, swimming with sharks, yoga, horseback riding, vision quests, and parrot husbandry. . . .” Horwitz spends a considerable portion of his history narrating the meteoric rise and fall of the now discredited Recovered Memory Movement (RMM) through which overzealous therapists supposedly “discovered” histories of sexual abuse in their vulnerable patients; these memories were actually false—no case has ever been corroborated and the phenomenon appears biologically implausible—but they tore apart families and sent innocent people to prison. Implicitly, Horwitz appears to be linking that tragic folly to the current PTSD crisis. He quotes Paul McHugh, a leading critic of RMM: “In but a few years we will all look back and be dumbfounded by the gullibility of the public in the late twentieth century and by the power of psychiatric assertions to dissolve common sense.” One suspects Horwitz may believe the same of our current trauma-obsessed culture. Needless to say, these observations are controversial. But Horwitz also points out that—unlike in past eras—nobody is presently questioning many of the shibboleths surrounding the diagnosis. He provides a trenchant and unsettling, albeit often contrarian, exploration of how biological symptoms can be constructed into a cultural-bound syndrome, and how that syndrome can transform public discourse. In today’s trauma-focused society, PTSD: A Short History is a volume as brave as it is wise.